Are you in a weight loss industry? Are you blogging around weight loss? Whether you know it or not, weight loss industry is a HUGE billion dollar industry which is only growing at rapid pace. Here’s an interesting statistic about weight loss industry in 2017 and 2018. The U.S. weight loss market is estimated to be worth $68.2 billion in 2017 which is a 2.7% gain, and growth should continue into 2018, when the market is expected to post a better gain of 3.2% to $70 billion (according to Market Research). So if you’re into weight loss blogging, you’ve a golden chance to make a ton of profits from your website. If you’re wondering about how you can succeed in weight loss blogging, this post is just for you. How to Profit from A Weight Loss Blog? Did you know about weight loss blogging? Well, I’ll be sharing some helpful tips to help you build a profitable weight loss or any other blog. It doesn’t matter what niche you’ve chosen, just follow the principles. Blogging is no longer what it used to be. Years ago, blogging was a personal virtual diary where you can update and share real life experiences. But today, blogging has evolved and creative people are secretly making a great deal of money from it. People who want to lose weight can go any length to achieve this feat. You have to understand how this all works out to funnel hungry buyers into your sales funnel. If you have a great landing page, you can easily build relationship with the audience and use proven marketing strategies to explode your income. Creating content by targeting a niche. It’s always better to blog around a specific topic (such as belly fat loss tips for women) instead of targeting a broad topic (such as weight loss) if you want to build targeted audience quickly. Keep an eye on your competitors audience so you’ll know what to cater and more importantly what to avoid. Always perform keyword research before you write even a word for your next blog post. That way you can come up with less search volume keywords (preferably 1000 or below monthly searches) you can target to rank for. Start a YouTube channel and tell everything you know about weight loss. If you’ve personally transformed yourself from fat to fit, it’s even better as most people on YouTube would love to get advice from people who’ve actually made it. Don’t create boring and generic content. There’s no point of creating thin content that’s not useful for anyone. If you really want to become a success in weight loss blogging niche, avoid creating generic and boring content. Focus on your target audience and create content that serves their wants and needs. If you build it, they won’t come. If you create content and don’t care about promotion part, no one is going to discover your blog. As a rule of thumb, spend at least 50% of your time doing promotion and 50% in content creation for best results in the long run. Not creating an email list will be a huge mistake. Whether you know it or not, every dollar you spend on email marketing has a HUGE return of $44.25. Email marketing also has a conversion rate 3 times higher than social media, with a 17% higher value in each conversion. So you really can’t ignore email list if you want to profit from weight loss blogging. 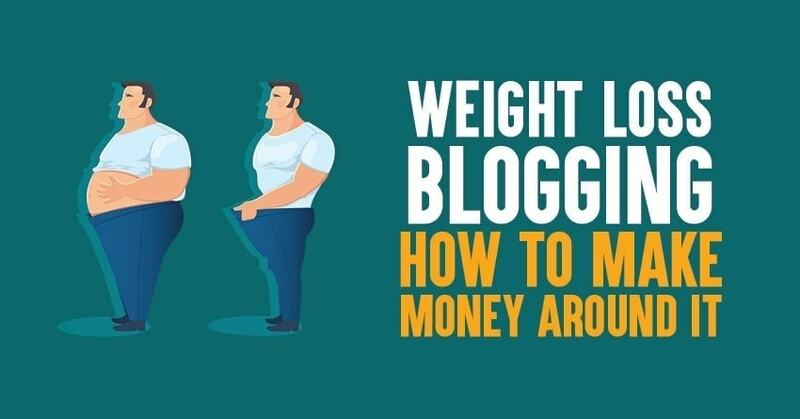 Here are some of the ways you can make money from weight loss blogging in 2019. Before you dive into weight loss blogging, it’s important for you to decide on what monetization strategy you’re going to implement. At its basic, you need two major things to make money from blogging. The #1 biggest mistake most people make while monetizing their site is, they either don’t have any plan or they simply implement several monetization methods at once. Both are wrong. The best way to come up with a monetization strategy is to look at your competitor websites and see in what ways they are making money from their audience. Here are few ways you can profit from weight loss blogging. Let’s talk about each one of them briefly so you can better understand how you can use weight loss blogging to monetize your sites. Affiliate marketing is definitely a great way to earn additional money from weight loss blogging, provided you know how to do it right. It helps you earn money even while you sleep. The BIGGEST key of successful affiliate marketing is website traffic. The more website traffic you get towards your affiliate products that include your affiliate referral links, from naturally more sales you will be able to generate and the more commission you will make from affiliate marketing. Become an affiliate with ClickBank, Amazon, eBay or Commission Junction (they are all free to sign up) to generate income with affiliate marketing. Once you’re signed up with such platforms, you get an affiliate referral link you can use to promote your products and put it on social media, email lists, websites etc to make money. Take quality time to choose a product (have a look at the best affiliate programs) to promote and write down a unique, unbiased and highly informative product review as product reviews work like a charm in affiliate marketing. Here are few quick tips for you if you want to increase affiliate sales in weight loss blogging industry. It’s better if you prefer an affiliate product that offers recurring commissions so you can earn commissions every month or year until the subscriber stops paying for the product, not just once. Focus only on promoting limited number of affiliate products so that you can promote them effectively and make more commissions in the long run. Create product reviews, detailed tutorials, video tutorials around the products you promote. Educating your audience around weight loss blogging products is the surest way to increase commissions. Weight loss blogging has one biggest benefit. It has huge CPC where you’ll most get traffic from countries like US, UK, Canada and so on. The best thing about driving organic traffic with huge CPC is that you can use literally any type of monetization strategy to get more benefits. Even with AdSense (where most of the industries have low CPC), you can still make thousands of dollars if you’re generating thousands of visitors from search engines to your site. You need to place the ads in the right spots to be able to get more clicks. Make sure to target the right keywords that have better CPC (around $1 and more) to be able to make more money by using the above mentioned monetization sources. You can use tools like SEMrush if you want to come up with high CPC and low search volume keywords. With SEMrush pro account, you can do all the following things easily which will be helpful for you in building a better blog around weight loss blogging. There are a lot of people who are looking for professional fitness advice. If you’ve enough experience or a certified fitness expert, you can become a fitness coach by showing your portfolio and start getting clients to earn a lot of money every month. Write for your ideal clients instead of writing content for everyone. That way you’ll attract the right people who are keen to hire you for your mentorship. Share a ton of useful advice for free in the form of articles, eBooks, videos and so on. If your followers feel like your advice is solid, they would gladly pay for you when you offer something premium such as coaching services. Make sure to check out other fitness bloggers who are offering coaching services in weight loss blogging to get ideas. Find out how they are crafting their consulting services and how much they are charging to get an idea. Here are some of the ways you can sell your own products from weight loss blogging to earn more money. It can be counted as a passive income source since you’re working hard in the beginning and the sales come later automatically if they are good. You can use sites like Payhip to sell your digital products easily (if not from your blog). In my weight loss tips blogs, intensive market and keyword research is my utmost concern. This is especially important if search engine is your target for targeted traffic. If you’ve other means of generating traffic to your weight loss review blog, you still can’t do without quality content. Research your market and read what other authors have written about the topic under discussion. If you want to know how people can lose 10 pounds in 3 days, don’t just write articles without getting the pros and cons from practitioners. Off course, losing 10 pounds in 3 days can be achieved, but it can pose some health problems. It’s not advisable to lose much pounds in a short while, take it step by step. So, when writing your content, clarify issues and don’t be too authoritative or opinionated. Stand between the ‘gap’ and let your article stand out from thousands of new posts that are published every day. Quality content is the best foundation for your weight loss review blog. But you can apply ‘quality’ to every article you write, irrespective of the niche or model. What has networking got to do with growing a blog? Well, a lot! Networking is a wide topic and oftentimes, we don’t fully understand what it means. Networking goes beyond social media, or forums and the like. The real networking deals with connecting, sharing and getting other people to fall in love with your content, so they can build a community around your blog. In my weight loss review blog, I’ve succeeded in networking with over 2,000 weight loss and fitness enthusiasts. I literally don’t promote this blog as I did at the beginning, but I’m happy with the growth. Networking simply means connecting with other like minds, in a bid to sharing helpful and valuable contents with their audience. Guest posting is a great way to network with other blogs. The good side about weight loss blogging is that it’s wide, rabid and evergreen. People would continue to search for weight loss programs, and other helpful information to help achieve them a definite goal – keeping fit and gaining a good physique. And this is your passport to earning some cool cash online. Once you’ve build a strong weight loss blog, by utilizing quality content and networking principles, you can sell to this ‘tribe’ and make good money. When you were building an email list, with short reports or e-books as your bait, what was the rate of subscription? If it was low, it means you’ve to look into other forms of product packaging – E.g. membership site and video, podcasts, webinars etc. People will buy your product if they perceive it has the right solution to their plights and bugging questions. If your product can’t meet this urge for freedom, it means you’ve a lot of work to do. Repurpose the product and make it VALUABLE. See you ahead! Here are few FAQs you might want to know to understand better about weight loss blogging in 2019 and beyond. #1. What are some content ideas for a weight loss blog? Where do I get new post ideas for weight loss blogging? The best way to come up with topic ideas around weight loss blogging is to do competitor analysis. Just find a list of 10 to 20 blogs in your industry to see what are all the popular posts that you can cover by targeting decent search volume keywords. You can also use tools like SEMrush for finding a ton of profitable topic ideas with ease. #2. Are there any useful tools that I should use in weight loss blogging? You can also install WordPress SEO by Yoast if you’re using WordPress, which is a free tool used for optimizing your blog posts for certain keywords to rank well in search engines like Google. #3. Is it profitable to start a blog in weight loss industry in 2019? We already talked about how much popular weight loss industry is, here’s the statistics of the industry: the U.S. weight loss market is estimated to be worth $68.2 billion dollars in the year 2017 which is a 2.7% gain and the market is expected to expect a HUGE gain of 3.2% to $70 billion dollars so obviously it’s profitable to start doing weight loss blogging. It doesn’t matter what industry you are in, you can build a profitable blog in any niche by creating the right content, defining your target audience and doing some in-depth competitor analysis. Hopefully, you can use this guide around weight loss blogging to avoid mistakes mentioned above and really focus on building a profitable blog that actually gets more search traffic and earns you profits. Let us know if you have any more questions around weight loss blogging in the comments below.